Barry’s Bootcamp, trademarked as “The Best Workout in the World,” delivers an hour-long sweat-fest that is definitely not for the faint of heart. Created by Barry Jay, the bootcamp has gained momentum and popularity from celebrity attendees and a ton of press. 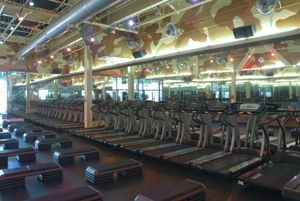 The workout features a combination of cardiovascular treadmill running and weight training. Loud, pumping music provides the background as experienced instructors put you through the ringer. The toughest of them all is Barry himself, who often prompts clients to work to the point of throwing up, at which time they will be rewarded with a free t-shirt (this is all in good fun, of course!). 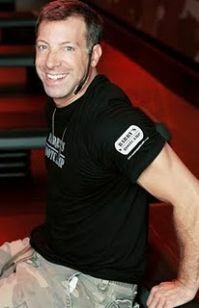 Barry’s Bootcamp has recently expanded from its original West Hollywood location to Sherman Oaks, New York City, San Diego, and most recently, Irvine. What you’ll need: A towel (or two) and a water bottle. No shower or locker facilities on site. This is hands-down one of the hardest workouts in LA. Since just finishing the workout is a major accomplishment, I tend to feel energized and positive all day after one of Barry’s all-out sweat sessions. I happen to be extremely motivated by screaming instructors, so the military-style barking commands at Barry’s really works for me! Don’t get me wrong, the instructors are all supportive and won’t actually “scream” at you…they just give off a hard-core vibe and make sure you know it’s a serious workout. I like that the Barry’s workout is offered at various convenient times throughout the day and that no class is ever the same! On some days you’ll find yourself running for 30 minutes straight up-hill, while on others you’ll alternate between 15 minute bouts of cardio and high-intensity weight training on the floor. The one thing I don’t particularly love about Barry’s is the sweaty environment. The foggy mirrors and dripping machines are a bit gross, but I think it’s a small price to pay for an amazing overall workout. The Sherman Oaks location is definitely newer and a bit cleaner feeling, but there’s something special about attending classes in WeHo, the original Barry’s location. A few words of caution: If you are not an experienced runner, make sure and let the instructor know before class starts so that they will be able to tone down portions of the workout for you. Erik Steffens…enough said!! I am not a runner and it had been years since I had attended Barry’s Bootcamp. I was extremely nervous but decided to throw caution to the wind, and took a class on my birthday. I met Erik and knew that everything was going to be ok, The thought of running for extended periods of time is very daunting, so when Erik announced that we would be running and strength training in three minutes sets, I was ecstatic. I will be attending my fourth class this afternoon and have noticed a significant change in my running, last week I ran at a 9.1 for 30 seconds…a record high for me. Although there is no competition at class, I find it very motivating to watch others push themselves and achieve their own personal fitness goals. I sometimes wonder how I will ever make it through the one hour class, but somehow I always do…and so will you! This crazy sweat inducing workout will become an addiction, and you too will join the Barry’s Bootcamp cult! Classes are offered ALL day at the Sherman Oaks location and parking is FREE for the first two hours with validation.